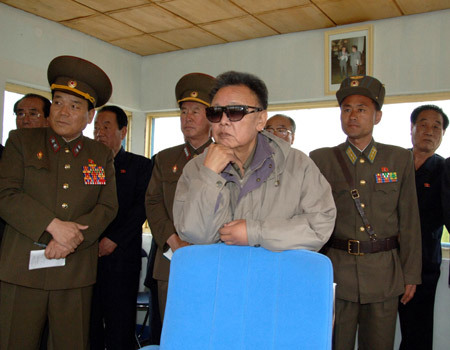 Son Chol Ju (left) attends military exercises with Kim Jong Il and Kim Jong Un in 2009 (Photo: NK Leadership Watch file photo/KCNA). Colonel General Son Chol Ju (Son Ch’o’l-chu) is a deputy director of the Korean People’s Army [KPA] General Political Department [Bureau] with the portfolio for organizational affairs. Son is also a member of the Workers’ Party of Korea [WPK] Central Committee, a deputy to the Supreme People’s Assembly and member of the KPA Party (WPK) Committee. Son has spent his career as political officer and commissar under the KPA General Political Department. His first significant position was a political officer in the KPA Navy. In the mid-2000s he became a deputy director of the General Political Department with the Propaganda (Publicity and Information) portfolio. From 2007 to 2009, Col. Gen. Son was part of an entourage of adjutants that attended many of Kim Jong Il’s on-site visits and military field inspections. From 2010 to 2012, he maintained a low profile in DPRK political culture, but it is highly probable he was part of Kim Jong Un’s transition team. After Kim Jong Un assumed the supreme leadership, Son became a routine member of the Suryo’ng’s entourage, attending numerous KPA-related public events. Son was appointed political director of the KPA Air and Anti-Air Force around 2013. He was elected a deputy to the 13th Supreme People’s Assembly in March 2014. He was temporarily demoted from Colonel-General (three-star) to Lieutenant-General (two-star) in 2015; his third star was restored by the end of that year. During the 7th Party Congress in May 2016, Son Chol Ju was elected a member of the 7th WPK Central Committee. According to the ROK Government, Son was appointed to his current position as deputy director of the KPA General Political Department around November 2017. His appointment was publicized in DPRK state media in May 2018.